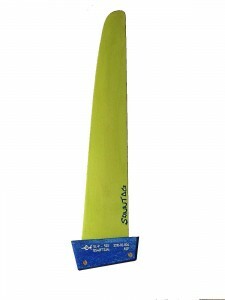 Sonntag is a new Fin manufacturer on the windsurfing market. We met the owner and chief designer Joerg Sonntag and his wife Alexandra at a recent event and was very impressed by their level of professionalism and understanding of fin technology. I was partially interested in the ability Joerg has to customise the Sonntag fin flex and twist to accommodate the individual rider. This is very unique in the fin world, as usually they are developed by heavy powerful male team riders and not for me. Basically I gave Sonntag my height , weight and the boards I use and he recommends a size stiffness flex % etc of the fin I need, FANTASTIC! Last word from Joerg Sonntag " We focus on high performance/competition fins in custom technology. We try to stay at size where we still can produce products adopted to specific customer needs. We use highest quality materials available on the market to create fins that work for you"
There are 3 fin ranges currently SL-S, SL-P and the GPS 2 with more coming in August.